You’re probably reading this blog because you have some questions raised by the film Cowspiracy. I’d like to address these directly – and tell you a little about our work on animal agriculture around the world. We all share Cowspiracy’s concerns about the environmental impact of animal agriculture and it’s great that these issues are being given more attention. However, our US office declined to take part in this project as they felt sure our position would be misrepresented (as it has been for several other organisations featured in the film). But sadly our reasons for not taking part have been misrepresented as well, in an attempt to create a sensationalist conspiracy where none exists. We work on the animal agriculture issues by campaigning on cattle ranching, animal feed and destructive fishing, we encourage people to eat less or no meat and fish, and we serve only vegan and vegetarian food at our on site cafe. The implication in Cowspiracy that we take money from the meat industry is completely false and baseless – we are 100% independent and accept no money from companies or government. So why do we work on animal agriculture? Animal agriculture has an enormous ecological footprint. The greenhouse gas emissions of the meat industry are greater than every plane, train, car, lorry and boat – put together. Overall, livestock agriculture (including all cows, pigs, sheep etc.) is responsible for about 18% of global greenhouse gas emissions – well below the burning of fossil fuels at 57%, but still of vital importance. Cattle ranching has been the biggest cause of deforestation in the Amazon, such that a few years ago nearly 80 per cent of deforested areas in Brazil was used for pasture – although action by groups like Greenpeace has been bringing it down. That’s why we campaign on a wide range of issues on the global animal agriculture and seafood industries, in countries all over the world. 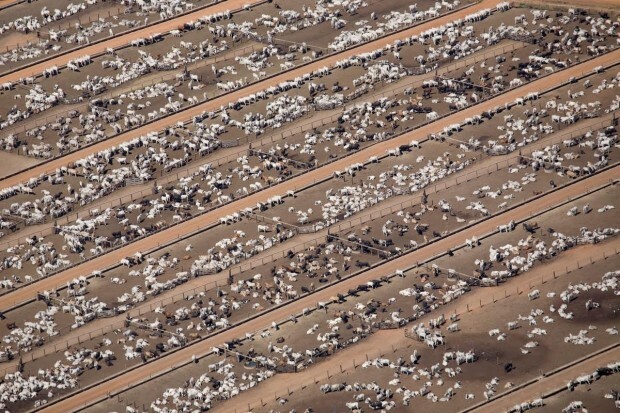 A cattle farm in the Amazon, taken during documentation of man made forest fires to clear land for farming and cattle. We’ve campaigned heavily on cattle ranching in the Amazon, despite great risks to our campaigners. 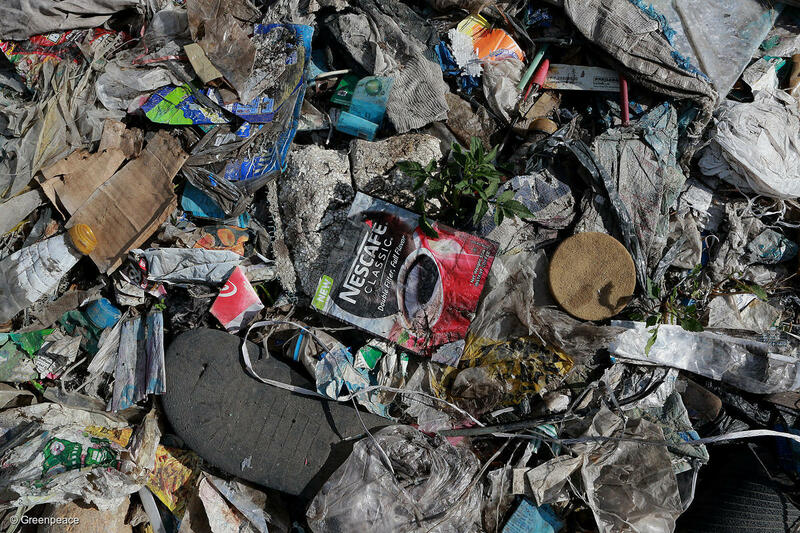 A three-year undercover investigation also exposed the top name brands driving the deforestation of the Amazon rainforest, by tracking beef, leather and other cattle products from ranches in the rainforest. This has had big results: Nike agreed to stop buying Amazon leather, and the World Bank withdrew a USD 90 million loan to Brazilian cattle giant, Bertin – money which was intended to fund further expansion into the Amazon region. It’s a good start – and shows that we can make an impact on this issue. Using soya for animal feed is another environmental catastrophe. The demand for this feed has lead to mass deforestation in the Amazon. 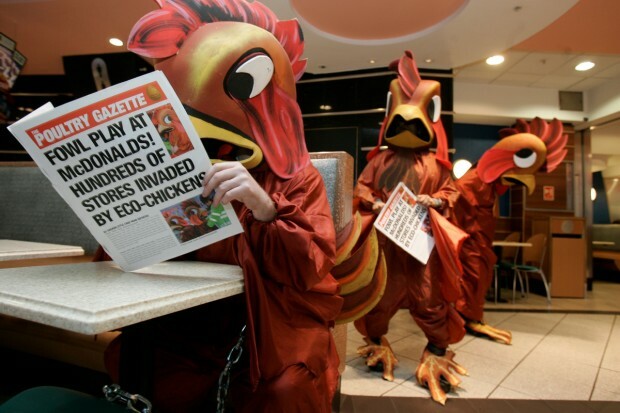 One of my favourite campaigns took McDonald’s to task over using chickens fed on this soya – and we won! Now, we’re working to preserve our hard-won soya moratorium in Brazil. 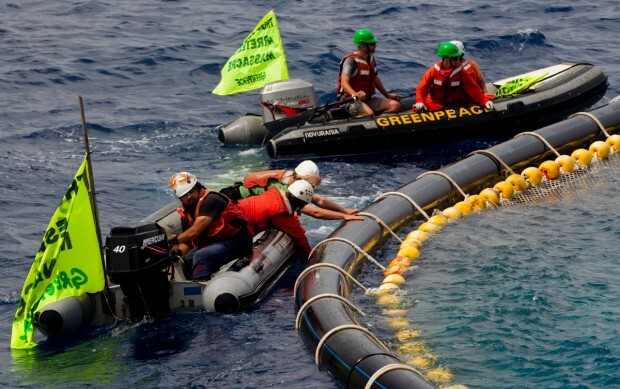 Greenpeace activists attempt to free Bluefin tuna from a net in the Mediterranean. Several Greenpeace inflatable boats were slashed by fishermen, and one activist was shot through the leg with a grappling hook. Turning to the oceans, our largest global oceans campaign calls for the creation of sanctuaries in the high seas, covering a massive 40% of the ocean. These reserves are off-limits to fishing, fossil fuel extraction and other industrial activities. Here in the UK, years of hard work on bycatch and unsustainable fishing have forced almost every supermarket brand tinned tuna to cut out destructive fishing methods – and now we’re going after the biggest tuna brands. One thing all of these victories have in common is people power. Together, we take on the greatest environmental threats by exposing destructive companies and governments, and using the power of mass pressure to make them change. Lifestyle choices can play a big role by reducing demand, but even massive changes in one person’s lifestyle can be eclipsed by corporate decisions taken in faraway boardrooms. So why don’t we call for everyone to be vegan? The short answer is that we do promote veganism and vegetarianism as a way to help. But we’ve never solely advocated boycotts or veganism. Voting with your money (not buying meat/fish) is great, but it gives the most power to those with the most money. 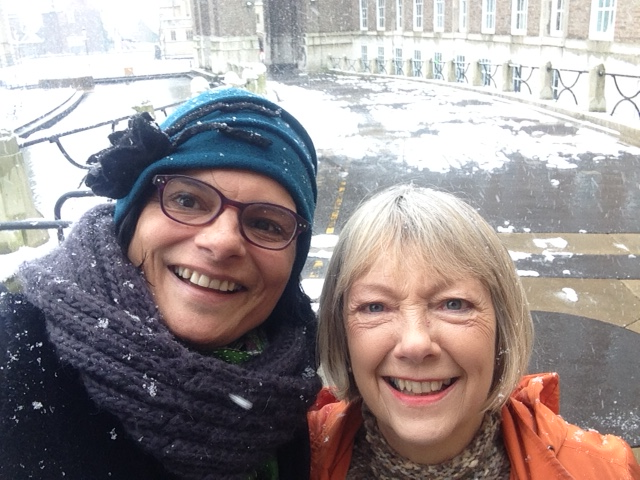 The ability to create change needs to be accessible to all, and work in a global context that incorporates cultural, class and accessibility issues. Advocating a one-size-fits-all solution of ‘go vegan to save the planet’ simply isn’t an appropriate, meaningful or impactful solution to someone who relies on subsistence farming or fishing for survival. The world needs to make big changes across a variety of sectors to solve climate change. Becoming vegan is a wonderful thing you can do to reduce your impact (I’ve been vegan for 23 years!) – but it isn’t the only thing. That list could include not driving a car, never taking airplanes, eating only locally grown organic food, avoiding palm oil and plastic, living off-grid, avoiding ‘fast fashion’ – a pretty significant challenge for the average person. But we encourage people to take the biggest steps they can, while taking on the corporations and governments that drive the biggest causes of climate change. For the time being, we’re using peer reviewed science to assess what we work on, but we also look at a variety of other factors including what work we’re best positioned to take on with our values, resources and structure. We’re privileged to work alongside many other environmental groups, each with different points of focus, so that collectively we can protect the planet.